When we accepted Jesus Christ as our Lord and Savior we became a new creation. But there may be aspects of our old self that we still believe. A statement I believe I heard from Beth Moore is how God burns the fake right out of us. God will test our faith. In so doing he tests what we believe in our heart. Circumstances we come across will bring out parts of us that are out of balance with who God created us to be. God breaks us where we need to be broken. He fractures the pride and lust and anger in our lives, but He does it to remodel us into His image. Once we heal, we end up stronger that we were to begin with. If we keep in step with the Spirit, God is going to make sure we get where He wants us to go. He is always working behind the scenes, engineering our circumstances and setting us up for success. Where have you been broken? What adverse circumstances are you facing? Do you have any overwhelming problems? Maybe God is remodeling you. Maybe God is increasing your capacity via adversity. When we find ourselves in those challenging circumstances, we need to know that God is ordering our footsteps. We can have a sense of destiny because we know that God has considered every contingency in our life, and He always has our best interest at heart. When the test comes, it is always about God and what we believe about him. The silversmith, held a piece of silver over the fire and let it heat up. He explained that, in refining silver, one needed to hold the silver in the middle of the fire where the flames were hottest so as to burn away all the impurities. 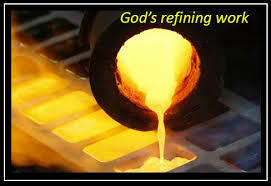 Think about God holding us in such a hot spot – He sits as a refiner and purifier of silver. The silversmith was asked if it was true that he had to sit there in front of the fire the whole time the silver was being refined. The man answered that yes, he not only had to sit there holding the silver, but he had to keep his eyes on the silver the entire time it was in the fire. For if the silver was left even a moment too long in the flames, it would be destroyed. Today, if you are feeling the heat of the fire, remember that God has His eye on you and will keep His hand on you and watch over you until He sees His image come out. If there was a better way, God would have taken it. God does not put us through something that he doesn’t give us the power to overcome. That means getting ourselves in tune with the Holy Spirit. We have to listen to His still, small voice prompting us and believe that He is setting us up for success. Agreeing with God’s words to us and about us – and seeing ourselves as he has called us – will help us accomplish what he will require of us. God expects us to pass the test. He always teaches us before He tests us. Those that know God is bigger and more powerful than any problem thrive in the toughest circumstances because they know that impossible odds set the stage for amazing miracles. When we have our eyes on the test we always fail the test. If we have a negative reaction to the test, we do not believe the truth. Maybe we should stop asking God to get us out of difficult circumstances and start asking Him what He wants us to get out of those difficult circumstances. The link of all the tests of faith are based upon whether or not we believe what God has promised. Opportunities often look like insurmountable obstacles. So, if we want to take advantage of these opportunities, we have to learn to see problems a new way – God’s way. Then our biggest problems may just start looking like our greatest opportunities. Think of every opportunity as a gift from God. What we do with that opportunity is our gift to God.